When it comes to giving a good presentation, it’s not enough to just “follow your instincts”. 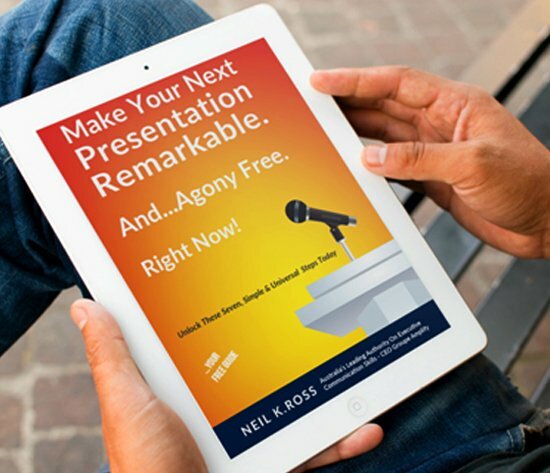 Learning some public speaking techniques can help you deliver the types of presentations that will leave people wanting more – and taking action. One key technique is knowing what type of words will ‘work’ with an audience and why. Three methods for unleashing words that work are – repetition, the rule of three, and rhetorical questions. A word or phrase mentioned only once is likely to be forgotten, but when spoken several times it has a greater impact. It also adds a kind of rhythm to the speech – much as we experience with rhymes and music lyrics. You only need to think of Martin Luther King’s dream speech for an example. He repeated the phrase “I have a dream” eight times, and “now is the time” four times – all at the beginning of consecutive sentences. Repeating words or phrases in this way is known as ‘anaphora’ in Greek, and can be useful for motivating listeners into action. It’s often said that things happen in threes, and there does seem to be a universal principle at play when it comes to the number three. It pops up in religious scriptures (e.g. the Trinity), in children’s fairy tales (such as The Three Bears), as well as in design, music and in movies – and may in some way reflect the natural order of things. Who knows exactly why three is powerful – the important thing is that the rule of three (omne trium perfectum in Latin) works well in presentations and speeches.  “I came, I saw, I conquered” by Julius Caesar.  The famous French motto – “Liberté, Égalité, Fraternité!”.  Abraham Lincoln’s “Government of the people, by the people, for the people”. Reading these aloud makes it clear how much more satisfying three statements can be than just one or two. A rhetorical question is a question that is not meant to elicit a direct answer. Rather it is done to make a point or to gain the audience’s attention and get them thinking. The answer may be implied in the question or it may be provided by the speaker. “How much longer will we put up with this?” is an example of a rhetorical question. “Does money grow on trees?” is another. Words and techniques matter, so make sure to incorporate some of these examples of words that work into your next speech or presentation. To learn more about how to give a good presentation, contact us.